"Few dishes are so easy and taste so good as this one. This creamy artichoke dip improves with 12 to 24 hours in the fridge, allowing all of the flavors to meld. 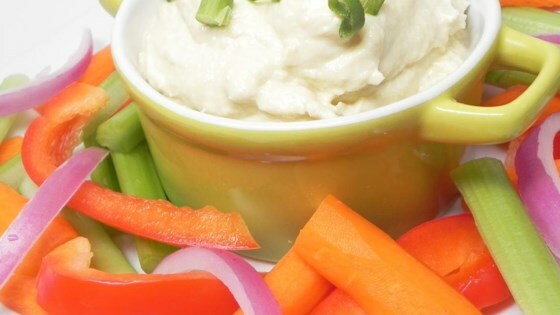 Delicious served with roasted veggies, carrot sticks, pita chips, or tortilla strips. If you like artichokes, this dish has your name all over it." Blend artichoke hearts, Parmesan cheese, mayonnaise, sour cream, and garlic in a blender until smooth; transfer to a serving bowl. Stir lemon juice, salt, and pepper into the dip. Super-easy, twice-baked, warm and cheesy. So nice and easy. I usually make a hot artichoke dip but this will be easier to take out. Whole family enjoyed and will definitely make again. Great taste! Definitely better the next day. I added some fresh dill and enjoyed it even more. Thanks for sharing. Easy to make and delicious!! So glad I forgot to buy dip at the grocery store. I had all the ingredients in my pantry and tastes so much better than store bought. Very good. A little thin. I may add cream cheese next time...also maybe some black olives?? Great recipe! Thanks! I roasted the artichokes & added fresh spinach that wilted beautifully in before blending it. Will definitely make this again. Much appreciated!